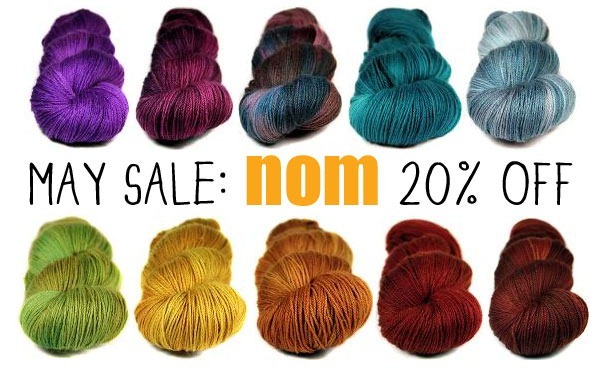 20% off Nom throughout May 2012, to celebrate the ever-so-distinct honor of Nom being chosen as Jess’ Selection on Ravelry this month! Whoo hoo! 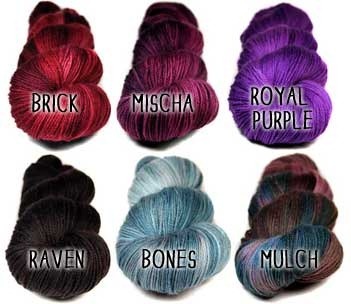 I’ve got several new colors in there for you, and I’m continuing to dye out-of-stock colors as fast as I can. Meet my new spinning wheel! It wasn’t exactly Love At First Spin… The entire head swayed back and forth wildly while treadling, due to an ill fit where the big, square peg attaches the head to the body. I was able to minimize the movement by cutting up a Kleenex box into a 3-sided shim. And the bobbins each had a spot where they scraped against the wood backing when pressed fully down on the shaft, so I used a cereal box to cut little, circular washers that keep the bobbins spaced further out from the base. The wheel is pretty finicky, as are almost all Spinolutions I suspect, but I really feel like it’s worth the trouble to have a wheel that provides so many things on my wish list. I hope so, anyway. I’ll report back after I’ve used it more. Why I sold the Majacraft Aura (because I know you’re going to ask): My bad back screamed out in protest every time I had to carry it from one room to another, or heaven forbid up and down the stairs. It’s a large, sturdy wheel and I am a giant wimp. (If you are less wimpy than me, it shouldn’t be an issue for you.) Also, my personal preference is for the flyer arms to have pegs or hooks (for no other reason than because that’s what I’m used to) and I never really fell in love with the squeezy-wire-circle contraption. Don’t get me wrong, I loved the Aura and would still recommend this wheel to others. 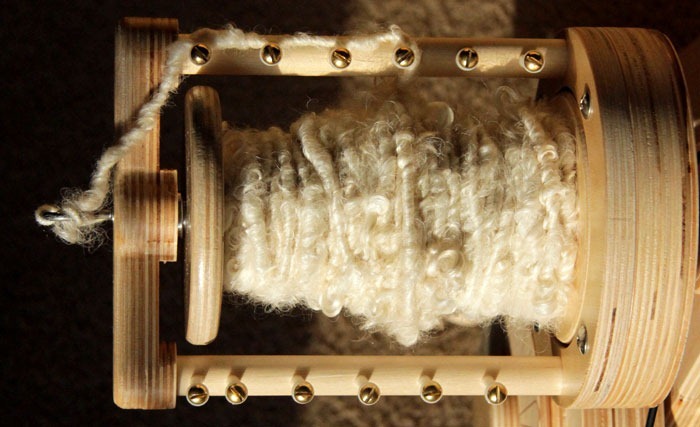 The craftsmanship was impeccable and the wheel is capable of making gorgeous yarn of almost any style and thickness. It just wasn’t the right wheel for me. I only have one true “complaint”… The large, sharp wire coil that acts as the orifice hook sticks out and gouged into my leg a few times while I was absentmindedly walking by. I wish Majacraft would put some kind of cap on the end, or even just a dollop of hot glue.